ELECTEK LED Night Light Wall Plate is a DIRECT REPLACEMENT for any standard outlet wall plate. Just remove you existing outlet wall plate and install the ELECTEK LED Night Light Wall Plate to instantly transform your existing outlet into an outlet with a night light! No wires, batteries or special connections required. The ELECTEK LED Night Light Wall Plate is easy to install. Just remove your existing wall plate and replace it with an ELECTEK LED wall plate. The ELECTEK LED Night Light Wall Plate is so slim that you won't even notice that the LED is there until it gets dark and the light comes on! With the low profile design, there's no more tripping or catching on protruding night lights. Does not obstruct any outlets. Unlike plug in night lights, the ELECTEK LED Night Light Wall Plate leaves both outlets free to use. LED technology allows enough light to guide the way but with very low power consumption. White LED lights give off a cool white light just bright enough to light the way and will last up to 150,000 hours. The photocell light sensor turns the light ON automatically when it gets dark and OFF when it gets bright in the area from any light source. The photocell light sensor turns the light ON automatically when it gets dark and OFF when it gets bright out. Every ELECTEK LED Night Light Wall Plate is individually tested before it leaves the factory assuring buying confidence and trouble free operation for years to come. Industry leading 2 year warranty and trouble free service. 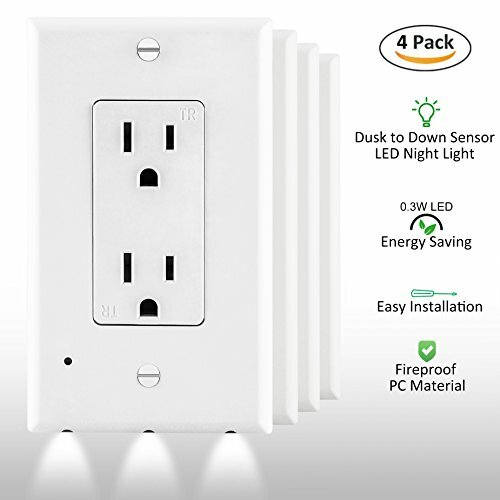 Please note: This product works with standard Décor outlets only and will NOT work with any Duplex outlets.